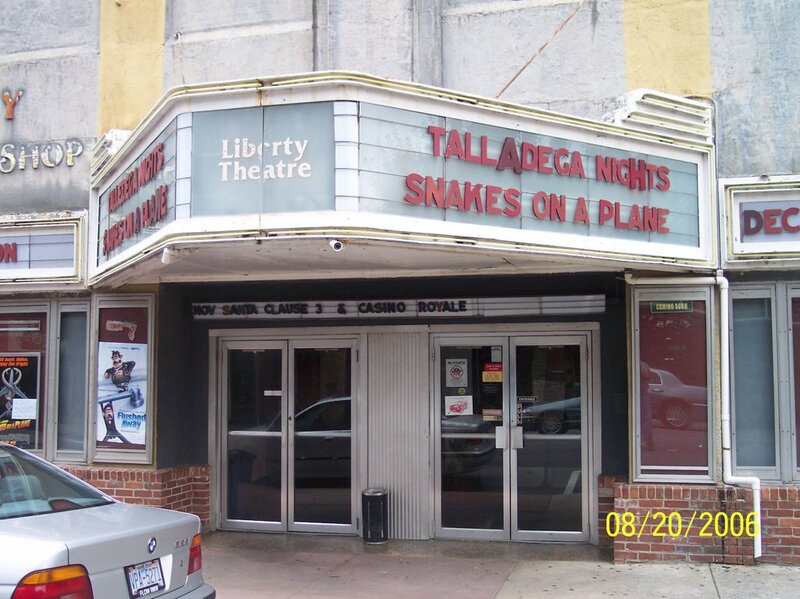 I’ve mentioned the Liberty Theatre a number of times since Greenbriar Picture Shows opened Dec. 27, 2005. 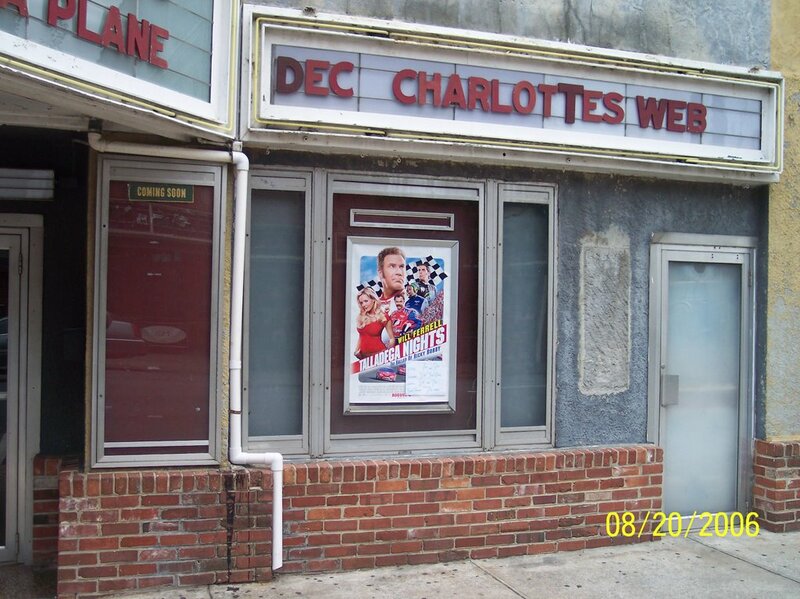 It was a small town venue for many a great show, and remains today as our last surviving local showplace. Others came and went through the years. 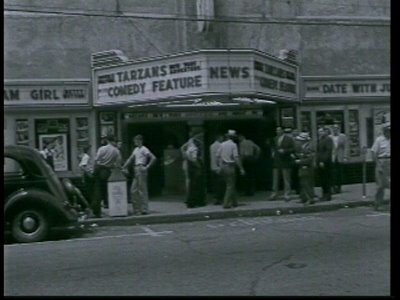 There was the Rose, which closed its doors when talkies arrived --- then the Orpheum, which became the Allen in 1941. That one burned in the early sixties. My best friend growing up saw Brides Of Dracula there shortly before the fire. The Liberty and the Allen had a product split. By the end of the war, they were the only houses left, so Hollywood’s bounty was divided between them. The Allen took all of Warner Bros., Columbia, Universal, RKO, and 20th Century Fox, while the Liberty was exclusive with Paramount, United Artists, MGM, and Republic (in a market like ours, the Republic concession was perhaps the most valuable of them all). In the summer of 1948, merchants and town officials got together and arranged for a documentary to be made about our community. It is the purpose of this film to bring to mind the vast opportunities existing in this area and to help interest its inhabitants in its future progress, said the producer, whose staff included a photographer from Fox’s March Of Time series and a narrator formerly with radio’s Theatre Guild Of The Air. The finished product was shot in 35mm and ran forty minutes. One nitrate print was furnished to the Liberty and shown on sporadic occasions over the next forty years. I saw it at a Chamber Of Commerce event around 1987. A video master was eventually made from the original, and that’s how I came by the DVD from which these frames were captured. Dating the Liberty footage was a simple matter of checking the show on the marquee against ads in 1948 newspapers. The images shown here were made on either Monday or Tuesday, July 26 or 27. 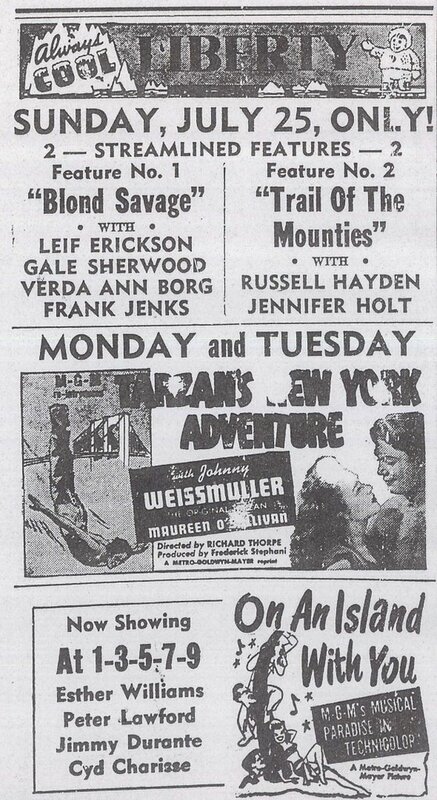 The program featured Tarzan’s New York Adventure, a 1942 feature which was revived by Metro in 1948. This was a time when you still had heavy pedestrian sidewalk traffic. Kids and teen-agers were up and down that Main Street all day and into the evenings. The Liberty routinely decorated their front with one-sheets on either side, two complete lobby card sets, and generally a three-sheet between the two entrance doors. 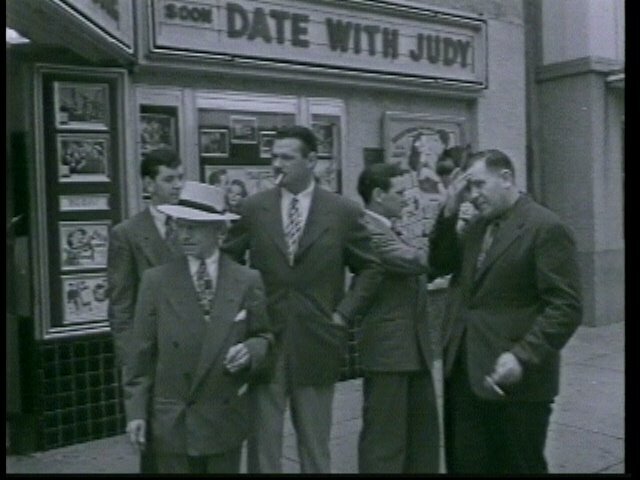 The "comedy feature" was another oldie from 1942 --- About Face, a Hal Roach streamliner with Joe Sawyer and William Tracy. The Liberty maintained a policy of three changes a week and double features on Saturday right up into the seventies. Management duties were in the capable hands of Colonel Roy Forehand, who more than lived up to his rank with first-class showmanship and staff discipline, which he maintained in very much the military manner. As suggested in previous Greenbriar postings, Col. Forehand would brook no disruptive behavior in his theatre. 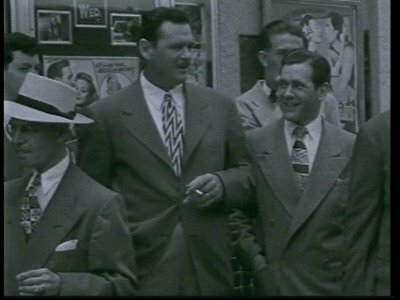 Here he is with cigarette and a particularly arresting tie posing with other smartly dressed locals on that summer afternoon. The Colonel would manage the Liberty until 1973. The last show he played was Don’t Look Now. Go HERE and HERE for two other stories in which he’s prominent. 3-D and Cinemascope temporarily gave the Allen an edge over the otherwise dominant Liberty. 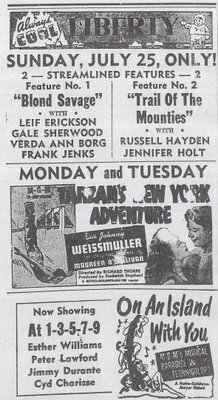 As luck would have it, their exclusive Warners access provided them the best of Naturalvision shows --- House Of Wax, The Charge At Feather River, and Hondo, while the Liberty had to make do with things like Metro’s Arena and Paramount’s Sangaree. I remember coming across a Viewmaster display up in the Liberty’s storage attic one time in the mid-eighties. The slides for Kiss Me Kate were still in place, and you could check out scenes from the movie in 3-D. 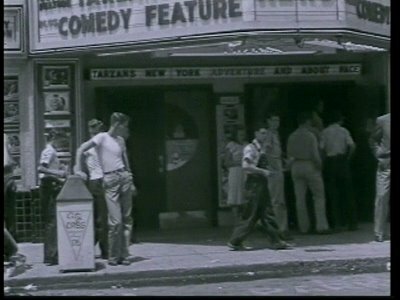 The Allen also got Cinemascope first by virtue of its relationship with Fox and a booking of The Robe. Unfortunately, they only had a twenty-five foot wide auditorium and the screen was a resolutely standard ratio frame. Several of those who attended told me years later that the anamorphic image was simply aimed toward the center of the flat screen, the right and left sides spilling off onto opposite walls. Patrons were obliged to view Cinemascope much in the same way they eventually would on television later during the sixties. The Liberty had essentially the same problem, which they solved by installing a new lens which would create a letterboxed image for all their wide programs. These last sad photos are the Liberty as it looks today. Like so many single screen houses, it was bisected and made unrecognizable by a retrofitting process that jerry-rigged a pair of shoebox screening closets out of what used to be an auditorium and balcony that seated 700. 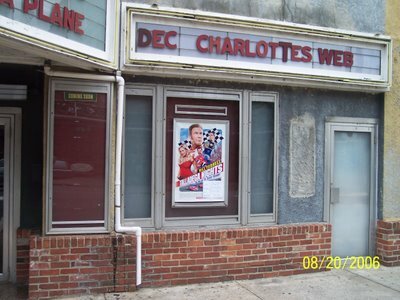 It is, however, one of the few remaining independently owned downtown theatres in North Carolina. There’s no problem getting all the biggest shows because there’s no competition within twenty miles. 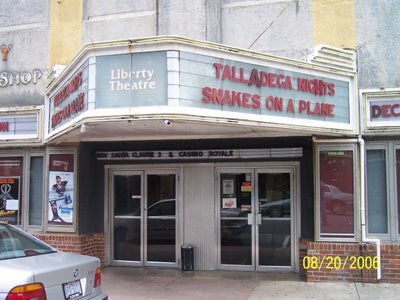 How else could we be so lucky as to have both Snakes On A Plane and Talladega Nights? I had a Twilight Zone moment after reading the Liberty Theatre story and your reference to BRIDES OF DRACULA... Just this evening before I logged on to the computer I re-read the interview with BRIDES OF DRACULA star David Peel in Little Shoppe of Horrors (#12/1994). I had only by happenstance rifled through a stack of mags in my library and pulled out this particular issue before retiring to my chambers. I was reminded of sitting in the Allen Theatre with my father nearly fifty years ago and seeing perhaps my first Technicolor horror movie, THE BRIDES OF DRACULA, the screen bordered by sumptuous blood-red velvet curtains. To this day this movie remains the singlemost vivid cinema experience of my life. And then tonight I look up your website and you're talking about it. I'm speechless. Thank you for the deja vu, John, I'm feeling pretty spooked right now. Regarding the Aug, 21, 2006 posting regarding the Liberty Theater... The Liberty Theater located on main street North Wilkesboro, NC, my home town. I came across this last night while researching my Boy Scout Master, Colonel Roy Forehand, who I had the most respect for as a leader and who played an important role in my life during that time. He was the manager of the Liberty until 1973. I saw so many new releases (good and bad) there while growing up; Star Wars, A Clock Work Orange, Vanishing Point, Dr. Strange Love, Billy Jack and so many more. I also remember being thrown out of the theater by the Colonel on one or two occassions, this was prior to joining his scout troop, Troop 336. At one of our annual week long summer camp-o-ree's at Raven’s Knob, NC where there were several hundred scouts in attendance I mouthed off to another scoutmaster who turned out to be an old army buddy of Colonel Forehand. When he found out he immediately put me on the task of digging a 6’ x 6’ square hole and he did not tell me the purpose of the hole… I wondered if I was to be buried there. Fortunately when I had reached about 4’ down he asked if I had learned a lesson about mouthing off… my response “YES SIR AND I AM SORRY SIR!” Lesson learned and I was off learning to tie knots or basket weave with the other scouts. Colonel Forehand ran Troop 336 like a well oiled and effecient military unit. And every 336 scout was proud to be involved. You can see Colonel Forehand in the 3rd and 4th photo on the posting as you scroll down. These are the only photos I have of the Colonel and I thnk you for them. When were you in the troop?